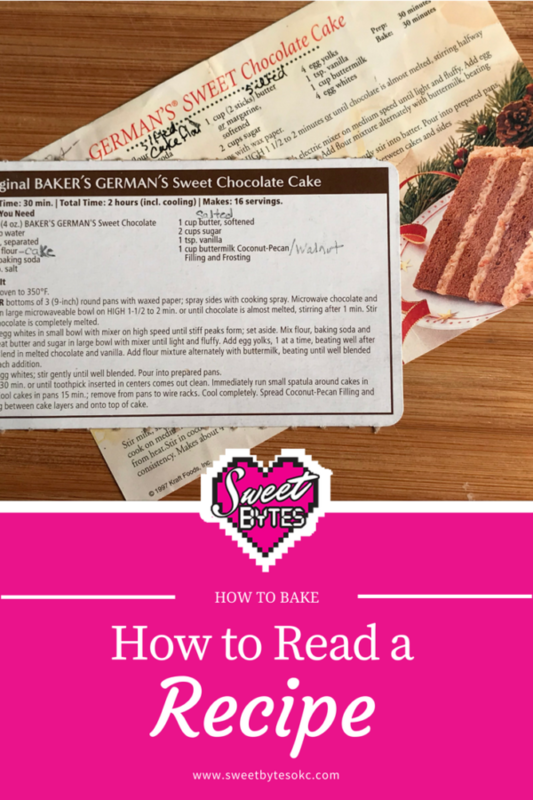 Let’s get started learning how to read a recipe! Find the recipe that you are going to work with. OK, I got mine! 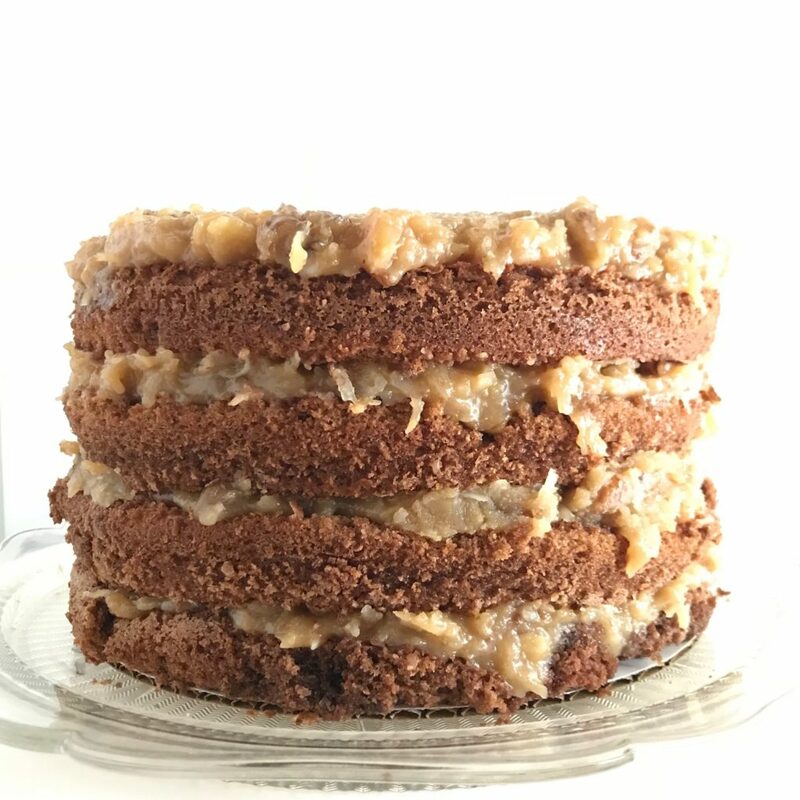 I am going to use my copy of the Original Baker’s German’s Chocolate Cake recipe. Step 2: Read the entire recipe, start to finish. This includes any notes that the author added and any side notes that you wrote in the margins. I do this every time I start baking a recipe. Even when I wrote the recipe, I re-read the whole thing before I start. It’s amazing what I can forget after a few months. For this step, only READ the recipe. Don’t start running around the kitchen grabbing things. Seriously, just read. Think over all of the ingredients and tools needed and read the step by step instructions start to finish. Equipment needed, size of pans, etc. 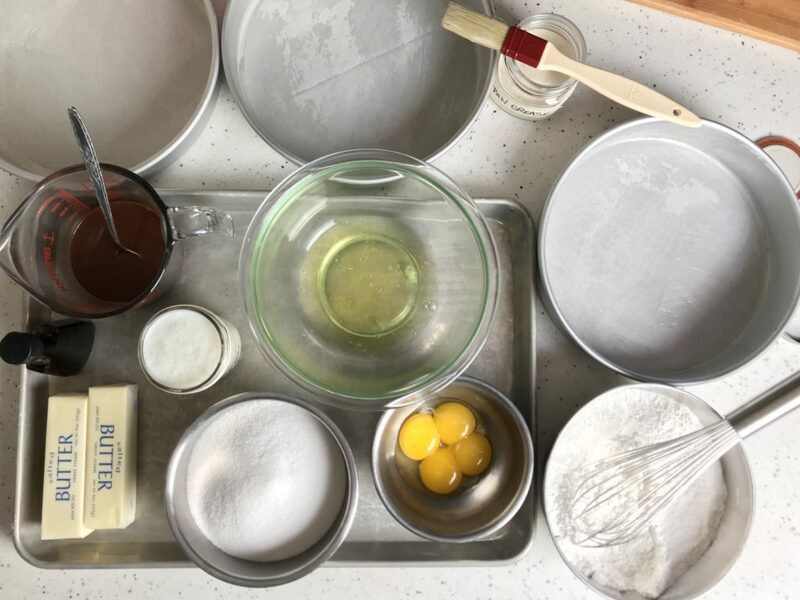 Do you have all of the equipment you need to bake this recipe? Are all of the ingredients available? Are any special tools needed? Then, I double check my supplies of things like parchment paper and plastic wrap. I make sure that I have everything I need. It never fails that right when I get really ready to make something I have to run to the store. There is no use resisting or plowing forward. Just go if you have to. Make a list so you don’t forget why you went and end up going to the store 2 times! Not that I would EVER do something like that. Step 4: Place your recipe in a safe place. When I start baking, I like to have the recipe somewhere nearby, safe from spills and splatters. I used to put it right in front of me, but a lot of times I borrow books from the library and they don’t take kindly to cake batter splatters all over their pretty books. Also, I’m a religious Fitbit wearer and I get more steps walking back and forth to check the recipe! For my loose recipes, I use these Sheet Protectors . I just slide the loose recipes in them and keep them in a 3-ring binder. They wipe off if I splatter something on them and I can easily take it out of the binder or the sheet protector. Step 5: Gather your ingredients and equipment. Don’t start measuring yet, just pull everything you need out of the cabinets and double check. Are you ready? Get everything in front of you and be sure. Sometimes when you read a recipe there will be abbreviations and terms that are new to you. Don’t guess at their meaning, be sure. Look up any things you don’t understand. Terms like “fold,” “whip,” and “sift” are common. Abbreviations like “tsp,” “t,” and “C” are common. Phrases like: “2 eggs, separated” could be very confusing. It doesn’t mean put one egg near the table and one near the stove. It means, you need two eggs, crack them open to separate the yolks from the whites in separate containers. Now “separating eggs” may be something you’ve never done. If not, you’d have to figure that out too. It’s a rabbit hole I tell you! The way the recipe is written is essential to your success. A cup of flour, sifted, or is it a cup of sifted flour? If it’s a cup of flour, sifted, you measure then sift. If it’s a cup of sifted flour, you sift then measure. When you read a recipe, everything is written in order and on purpose to help you be successful when you make it. Mise-en-place (French pronunciation: [mi zɑ̃ ˈplas]) means to put in place. 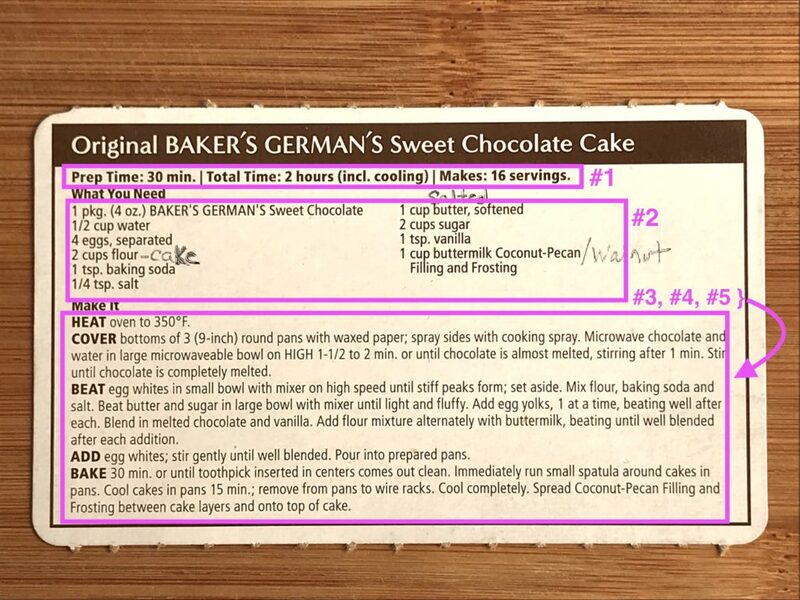 In baking, this means you measure out all of the ingredients the way the recipe requires. If anything needs to be brought to room temperature, do it now. This is when you separate eggs, toast nuts, chop the chocolate, zest lemons, soften butter or any other baking gymnastics required in the recipe. Basically, make every ingredient ready to use, just like in the cooking shows. I also prepare the pans by greasing them and lining them as needed. A lot of more advanced recipes require multiple steps and can span days before ready to serve. It’s still handy to have everything ready. 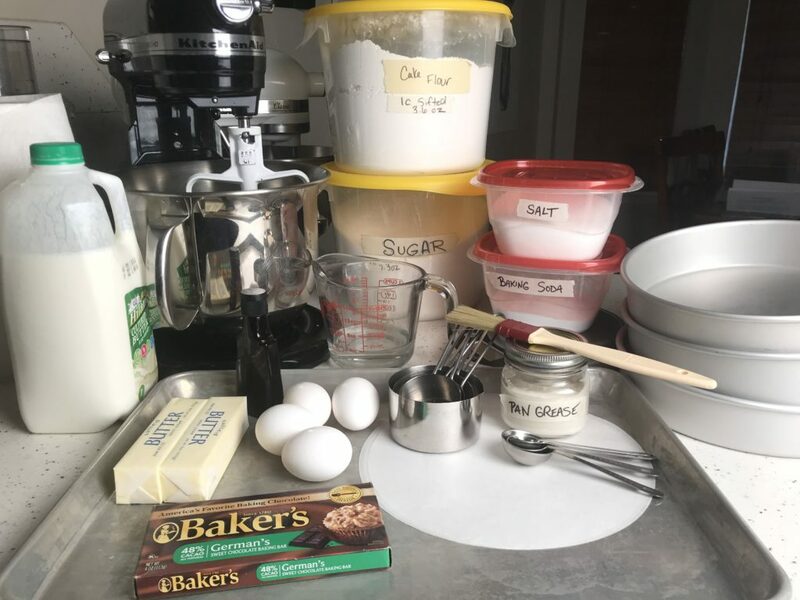 You can use baking sheets and labeled containers to hold all of your ingredients while waiting to use them. By this step, I have read the recipe at least 5 times and I am ready to begin the baking. Sometimes, I get cocky here and believe I have it memorized. BIG mistake. Always follow the recipe as you prepare it and mentally check off each step as you complete it. If I do this, I avoid forgetting steps or wasting ingredients. I don’t know if you’ve noticed, but baking can be a costly adventure! Plus, no one likes a cake with the sugar left out. After you have been baking for a while, you will decide to tweak your original recipes. Your tastes will lead you to add extra chocolate, switch 1/2 the vanilla extract with almond extract, etc. These changes are the fun of baking. Take notes when you do it! This is the “science” part of baking. Detailed notes can lead you to the next big discovery or help you to avoid making the same mistake twice. Plus, if you are like me, you will not remember what you did next time… even though you think there is NO way you could possibly forget. 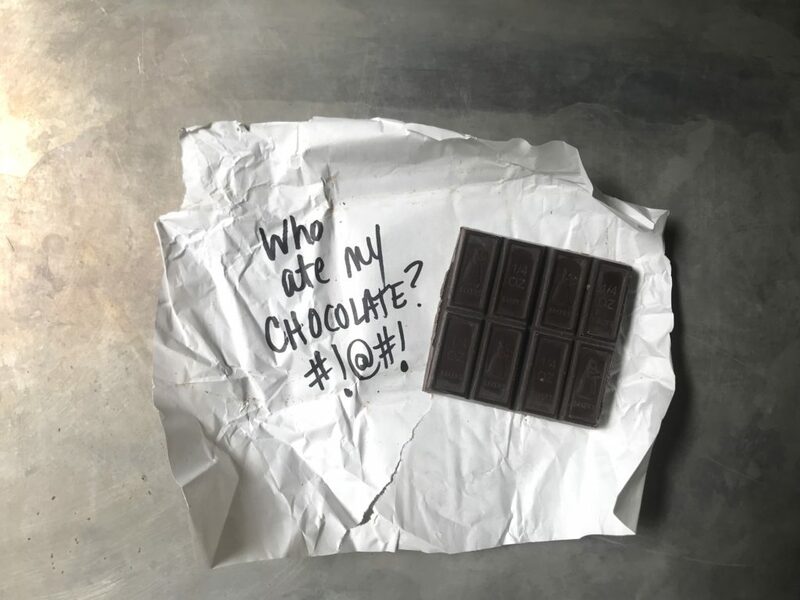 There is a fairly well-followed superstition amongst chefs and kitchen workers about what happens when you forget to be a humble servant in the kitchen. The kitchen “gods,” “fairies,” or “insert spiteful mythological creature here“ will see you! In fact, right when you think you are really hot stuff, they will immediately show you that you are nothing without their good graces. Sunken cakes, salty cookies, gluey pastry cream, you name it. All the bad things will happen the moment you think you’ve mastered the kitchen. So, stay humble, read the recipe, follow the recipe, and don’t invoke the wrath of the kitchen sprites. What’s your favorite site for finding new recipes? Better yet, what’s your favorite recipe? I look forward to hearing from you in the comments. If you have a question for me, please drop me a line and I will do my best to find you an answer! The best way to stay in touch is to sign up for the newsletter to keep up with all of the Delicious News!